The gaming phenomena that is Guitar Hero shows no signs of slowing down. Now, the forthcoming Guitar Hero World Tour game will feature several well-known instrument and equipment brands from the instrument industry. In the game, players will be able to win sponsorship from Ampeg, Audio-Technica, Marshall, Sabian, Vox and Zildjian, among others. The game will also include digital re-creations of famous stages, such as the House Of Blues on LA's Sunset Strip. "Gamers have come to expect a certain level of realism in video games and by collaborating with key brands in the industry we're able to deliver with Guitar Hero World Tour," said Dave Anderson of game-makers Activision Blizzard. "With the most advanced wireless instrument controllers, the in-game likeness of multiple multi-platinum recording artists and authentic on-stage gear, the game offers the ultimate rock and roll experience." Gibson is one company definitely not getting involved. 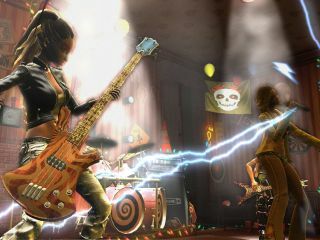 Gibson had its branding featured on the guitar peripherals for previous entries in the Guitar Hero series, but in March 2008 it took legal action against Activision for copyright infringement. Gibson claims it owns a patent on a game controller whereby "a musician can simulate participation in a concert by playing a musical instrument and wearing a head-mounted 3D display that includes stereo speakers."